Bringing home a puppy is exciting because he becomes a new member of the family. But, raising one is hard work, so the whole family needs to pitch in and do their part. The new puppy needs to be fed, walked, bathed and more. You’ll need to make sure each family member knows his or her job to help out. Plus, you’ll want to follow a few more tips to keep your puppy healthy and your home safe from any potential damage. This includes supplies to buy beforehand. Why is a crate important? The crate not only serves as a safe place for the puppy at night, but it can also help with the house and behavioral training. You can learn more about crate training, so you'll get the best use from this important tool. Your puppy needs a leash for walks, but what type is best? A good start is buying a lightweight, but strong leash at least 10 feet long. You can buy a longer leash as the puppy grows. Use the leash to train your puppy to come back when called and obey commands when on walks. You may think a bowl is just a bowl, so you just pick up any one you find. But there are some things to consider. Plastic bowls often become chew toys. The chew marks left on the bowl can harbor bacteria that can make your puppy sick. Find a bowl that is dishwasher safe and chew proof. The shape of the bowl matters, too. You can learn more about what shape is best based on the type of dog you’re bringing home. Choosing safe toys for your puppy can get confusing. Keep in mind that puppies are aggressive chewers, and any toy he can tear into pieces becomes a choking hazard. With a little research, you can learn to recognize unsafe toys. Bath time can be stressful for both puppy and pet parent, and there are many things to consider. Should you bathe your dog in a sink or tub, and you should towel dry or air dry? Take some time to learn the best options for bathing your dog at home to avoid causing your puppy the anxiety of going to a groomer. As a bonus, this can serve as a great bonding time for you two! Part of puppy care is making sure your pet gets enough exercise, so he's strong and healthy. If you don't have a fenced area for him to run, consider a puppy pen that allows a little freedom to run outdoors. A long line and tether can also be helpful to allow your dog room to run, while remaining safe and confined to a certain area. 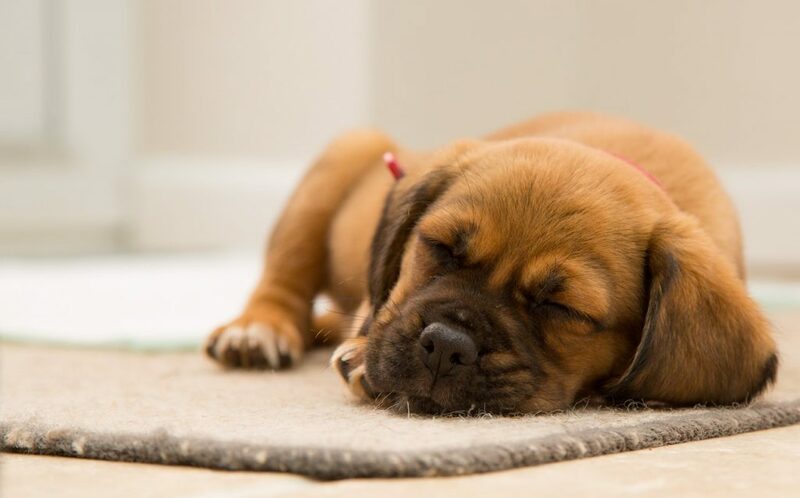 If you plan to take care of the pests yourself, you should take the time to learn about your options in flea and tick treatments for puppies. These treatments aren't recommended until puppies are of a certain age, so make sure you know when and how to use these products safely. Is the puppy allowed on the furniture? Who’s in charge of training? What correction is needed when the puppy makes mistakes? Where will the puppy be during the day, and who's in charge? Who takes the puppy for walks and where? Where will the new puppy sleep? Setting rules are the best way to ensure your routine is followed, so the puppy is cared for and learns to obey. Puppies grow up to be loved family members, so it's important to be prepared to care for your furry friend properly. Working as a team, the whole family can help make sure your new puppy is healthy and happy.